Few movies have the sheer visual impact and resounding influence of Blade Runner. Set in a gloomy Los Angeles of 2019, its rain-cloud shadowed, neon-tinged urban sprawl is the definitive cinematic dystopia. A dark city inhabited by renegade androids, ruthless hunters and all the poor schmucks who can’t afford a ticket to one of the heavily advertised Off-world Colonies. Though a box-office flop on release, Blade Runner endures, continuing to earn praise for its key creators: director Ridley Scott, cinematographer Jordan Cronenweth, special photographic effects supervisor Douglas Trumbull, futurist Syd Mead… But there is one artist involved in bringing Blade Runner’s noirish, hellish LA to life on screen who is rarely mentioned: Matthew Yuricich. The then-fiftysomething Croatian-American would often be the first person on the set of Blade Runner, arriving as early as 4.30am, to apply crucial final touches to his work before anyone else arrived. The tools of his trade were long-handled Windsor & Newton sable brushes (he’d use as many as 50 per day), razor blades and acrylic paints. His job was to give Blade Runner’s world its sense of scale, its depth, its vastness — in short, to bring it to life. And all without the use of computer graphics and digital effects. 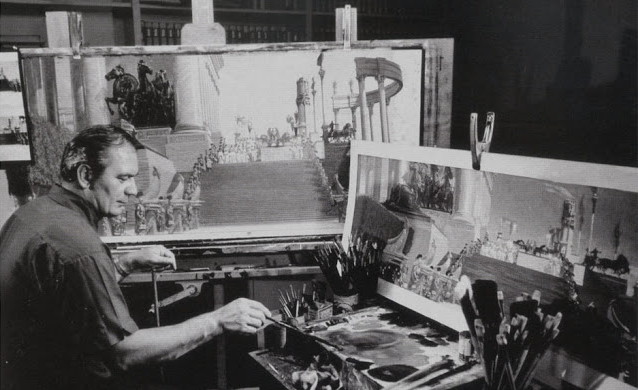 Matthew Yuricich was one of Hollywood’s foremost matte painters, the master of an art that has all but vanished now film-makers can utilise computer-generated imagery. Born in 1923, he created stunning visual backdrops for around 200 movies, including 1955 historical epic Ben-Hur, Alfred Hitchcock caper North By Northwest, sci-fi crowd-pleasers Close Encounters Of The Third Kind and Logan’s Run (for which he received an Oscar), and the spooktacular Ghostbusters. In the pre-CGI era, before blue screen and green screen swathed the visual-effects industry, Yuricich’s craft was an essential element of cinematic world building. It meant film studios didn’t need to construct every building seen on screen, or hire thousands of people to filling out teeming background crowds, or shoot on location to achieve that particular jaw-dropping vista. More often than not, these backgrounds or background elements were painted by hand, either on masonite or glass, designed and mounted in such a way that they would blend with real studio or location elements and thus be visually indistinguishable to the viewer. If that sounds like a tall task for anybody to achieve, imagine how Yuricich himself must have felt when it was first suggested to him, as a 26-year-old special-effects department artist, that he start working on mattes. “What the hell,” he said to his friend Jimmy Fetherolf, a fellow artist, “we’re never going to be able to do that kind of stuff!” But the trick, he found, was to, well, just keep working at it and learn as he painted. Which he certainly did, mastering new techniques along the way. He didn’t start painting on glass, for example, until 1953’s The Robe, having only worked on masonite or on photo enlargements previous to that. He also had to wrangle with getting his perspective correct for movies using the anamorphic format, by which his mattes had to be painted “squeezed” so that, when projected through an anamorphic projection lens, they would appear as they should, in full, glorious widescreen. 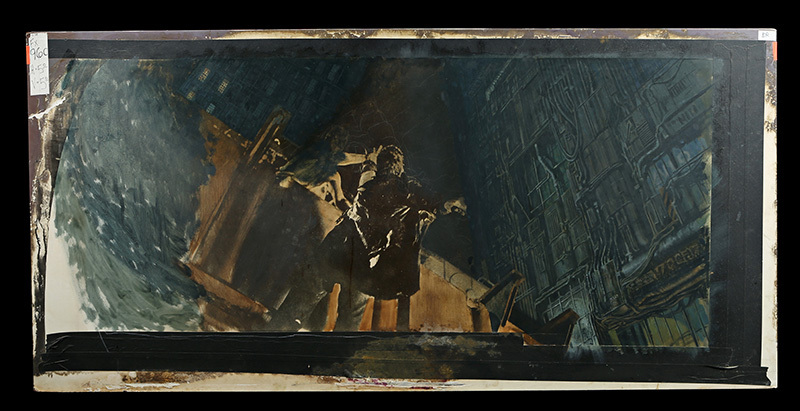 For his mattes on Blade Runner, Yuricich had to be careful to match Scott’s high contrast film stock, which meant limiting and tweaking his colour range. So if he was intending something to appear as black on screen, for example, he had to mix a specific, murky grey-green colour. As his assistant on that film, Michele Moen put it, “it was all in relation to the film; the painting itself was not a pretty picture to hang on the wall”. However, the artistry in such mattes as those featured in this week’s Live Entertainment Auction is undeniable. 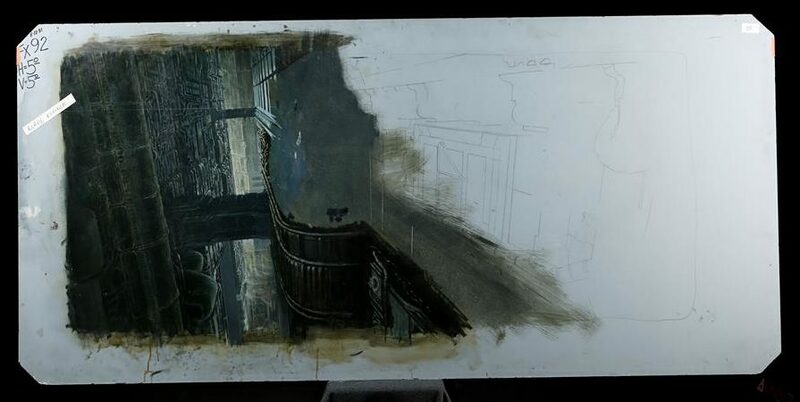 Without his scenic depictions of the Bradbury Building, atop which replicant hunter Deckard (Harrison Ford) and his deadly quarry Roy Batty (Rutger Hauer) have their final confrontation, it’s hard to imagine Blade Runner’s climax feeling quite so thrilling and vertiginous. By all accounts, Yuricich was quite a character. And he lived quite a life. He was close friends with actress Betty Grable, having met her while serving in the US Navy during World War Two at the Hollywood Canteen, where servicemen got to rub shoulders with celebrities. He also got to know Marilyn Monroe, having joined her softball team, and recalled going to a party at her home where “she chased me all over the damn house,” although he said he was too much “a stick in the mud in those days” for anything to happen that would have meant he’d cheated on his wife. Not that Yuricich was afraid to speak up for himself. When he accepted his Oscar for visual effects on Logan’s Run in 1977 after he thanked his wife Clotilde, he thanked… himself. “I think I deserve it,” he told the world. You can hardly blame him. A matte artist is only truly successful if you don’t notice their work. The audience should be wowed by what they’ve created, but only in the sense that they’re believing the world that’s depicted. If you’re sitting there mid-movie saying, “what a great matte painting,” then that matte painting has failed to do its job. It is an achievement that must simultaneously be impressive and invisible. Which explains why for more than half his career, Yuricich was unrecognised and uncredited for his work. Often, directors would not let him see how his mattes looked on screen. Much of his work was destroyed, or snapped up by producers after productions wrapped. Studios, meanwhile, weren’t exactly keen on giving up the arcane secrets of movie production, so they hardly applauded their matte artists in public. But now at least, all these years later, Yuricich’s huge contribution to cinematic art is starting to receive the credit he does indeed deserve. Cheers to get this content post. Much obliged. Thank you a great deal of with regard to this article post. Seriously Cool. Seriously appreciated this kind of post. Very much thank you again. art work that is very rarely pursued by people and it is very influential for a film that is produced, becomes more real as the original, a good article and I am very impressed with this article, allow me to recommend this website to my friends. I have read many other blogs but i liked your blog.